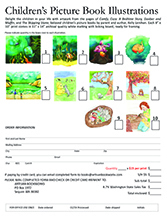 Delight a child in your life with an autographed copy of a children’s picture book and complete the experience with artwork from the pages of The Skipping Stone, Goober and Muffin, and/or Comfy, Cozy: A Bedtime Story, three beloved children’s picture books by parent and author, Kelly Lenihan. 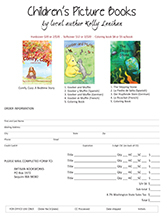 Although you can always order Kelly’s children’s picture books from your favorite online retailer or bookstore, if you’d like an autographed copy, please order directly from the author. Click on the image to the left to download the order form. If you already own any of Kelly’s books, request a free autographed bookplate—be sure to mention which book you have, the bookplates are customized for each title. Delight a child in your life with colorful artwork from the pages of The Skipping Stone, Goober and Muffin, and Comfy, Cozy: A Bedtime Story. Each 8” x 10” print comes in 11” x 14” archival quality white matting with backing board, ready for framing.